Be the hit of your next meeting! Get the blueprint to master your pitch, motivate change, close the deal, and more! FACT: Times have changed. Technology has changed. Attention spans have changed. In this increasingly-digital era, you are competing with millions of other messages every day. We are living in the most distracted generation in history. If you don’t know how to get people’s attention and keep it, you quickly lose them to text messages, emails, and social media. There goes your meeting. It’s not your fault. Nobody ever showed you a better way. Until now. PRESENTATIONS THAT CONNECT shows you the new rules for crafting your message so that it connects and stays with your listeners. Whether you are speaking one-on-one or one-to-many, you will have frameworks that will give you the upper hand in persuading important outcomes when you need them most. 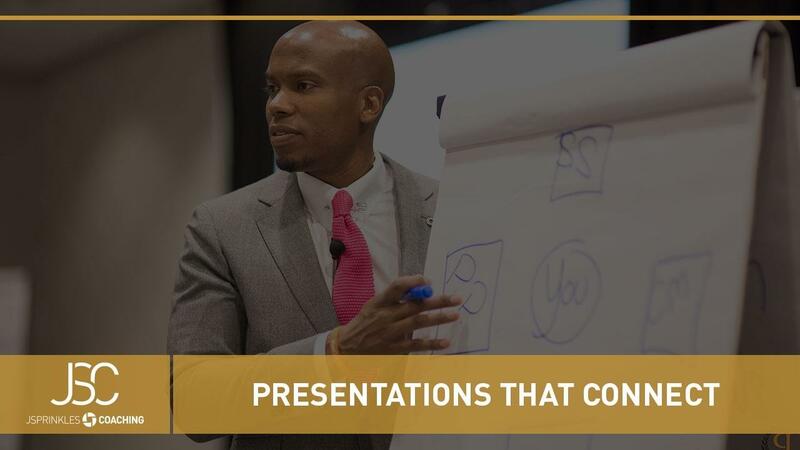 PRESENTATIONS THAT CONNECT will have an immediate impact on every business and personal interaction you have. You will show up noticeably different. You will be more visibly confident, you will command attention, you will increase your influence, and you will get the respect you deserve. FACT: People do business with and follow people they know, like, and trust. Learn how to earn their trust, influence behavior, and create profitable business outcomes, one presentation at a time.